I've posted this photo of my great-grandfather, Carl Johan Anderson, before, but these things are always worth sharing again. 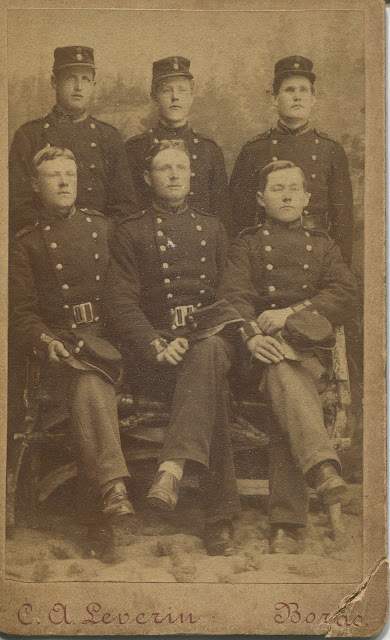 Carl Johan Anderson, back row, center, 1887. Carl Johan, my paternal grandmother's father, was born in Sweden in 1867 to Anders Svensson and Anna Katerina Mansdotter. According to his own account, he served compulsory military service at Fristad Hed for 21 days in 1887. He was due to serve again the following year but left for America instead. I was surprised to find this photo of Carl Johan in the basement stash last September, but very grateful to also have his account of his service to explain it. Gosh - even at 20 years old, he looks so very young in the photo. What a wonderful photo to complement his story of serving. Compulsory service for only 21 days?! I know this is your great grandfather, but who were the others and why THIS 6 together? I know, seemed odd to me, too. But I did a little checking, I guess service would be more accurately described as training and perhaps a way to register if there were to be a conflict. I've wondered that, too. Are these the friends who borrowed money so that he could buy passage to America? Or just a group of comrades from training? Not likely they were school-mates because Carl had very little formal schooling. Unfortunately, he only identified himself on the back of the photo. A lovely photograph of the young men. It makes me wonder what other treasures can be found in your basement stash !